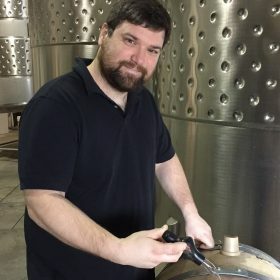 Sean Smith, a graduate of the 2012 Walla Walla Community College Viticulture and Enology program has been honing his winemaking skills with Bergevin Lane Vineyards since 2012. “Our decision to name Sean as our winemaker was simple. He has proven skills in the cellar and has managed all aspects of the winemaking process under the guidance of our former winemaker, Dave Harvey. Dave is an exceptional mentor in his field. Sean brings his passion and enthusiasm for the wine business to our team!” Prior to working for Bergevin Lane, Sean worked for Forgeron Cellars and Basel Cellars in tasting room and cellar positions. Sean is a Walla Walla High graduate and also graduated from Northwood University in Michigan. I got into wine because I wanted to get into a profession that got me out from behind a desk and got my hands dirty. I was also very interested in the science of winemaking and how a cluster of grapes can turn into such a tasty beverage. I took a risk by quitting my day job in marketing and I am very happy that I decided to do it!